The session on Tuesday remained much on expected lines. The Markets did see a follow-up up move following the previous day’s gain. At the same time, it continued to resist to all important 200-DMA at close levels as well. The benchmark NIFTY50 ended the day gaining 53.50 points or 0.53%. Going into trade on Wednesday, we keep the analysis on similar lines. At Close, NIFTY is likely to continue to face resistance at 200-DMA which stands at 10177. Also, we expect volatility to remain as we enter the expiry of the current derivative series. The session will continue to remain heavily dominated with rollover centric activities. Over and above this, Wednesday is also the last trading day of the Week. Thursday and Friday are trading holiday and we are all likely to see the Markets taking cautious stand at Close. 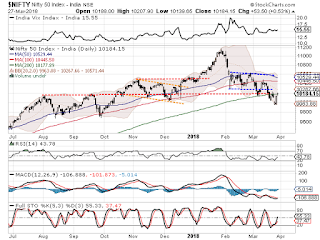 The levels of 10225 and 10270 will act as immediate resistance area for the Markets. The supports come in at 10130 and 10075 zones. 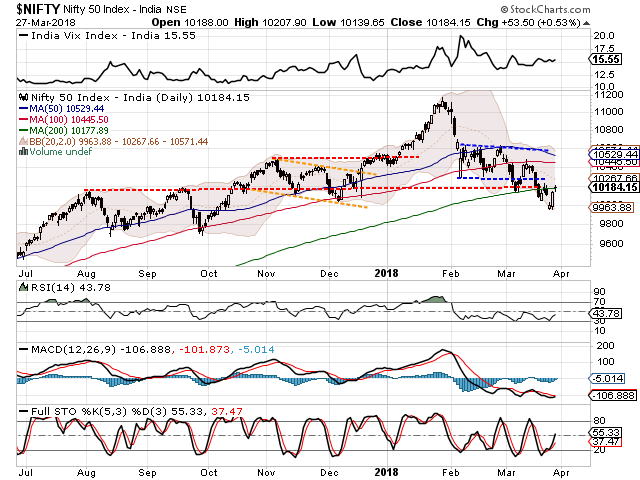 The Relative Strength Index – RSI on the Daily Chart is 43.7764 and it is seen remaining neutral against the price showing no divergence. The Daily MACD is still bearish as it trades below its signal line. However, it is seen sharply moving towards positive crossover. No significant formations were observed on Candles. While having at close look at pattern analysis, it is evident that the NIFTY has attempted a strong technical pullback. However, at Close levels, the levels of 200-DMA has acted as a stiff resistance to the Markets. Overall, if the NIFTY has to avoid a fresh consolidation, it will have to move past the 200-DMA at Close levels. While it does so, we will see good amount of volatility persisting in the Markets. We also expect that the NIFTY will consolidate in a defined range before it attempts an up move. More so when Wednesday is a last trading day of the week, it would not be a surprise if we see some caution weighing high on the Markets towards the Close. In any case, the Markets is sitting on large number of shorts. Any downsides are likely to remain limited but oscillations may remain volatile. We reiterate continue making select purchases while adopting a positively cautious view on the Markets. Sound technical setup is observed on stocks like CGPOWER, VEDANTA, HIND ZINC, RCOM, IDBI, ITC, GVK POWER, DLF, FUTURE CONSUMER, NCC and Jet Airways.